Jaguar has been pushing the limits when it comes to luxurious sports cars for years. 2016 will be no different, as Jaguar has rolled out the boldest warranty plan available with Jaguar EliteCare. 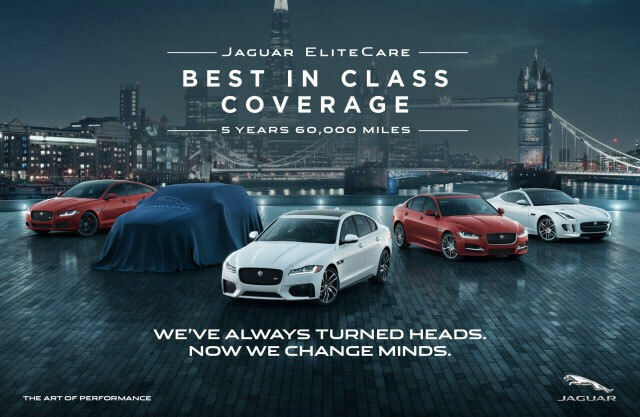 Jaguar Little Rock is proud to be your local source of the 2016 Jaguar line of products and we can’t wait to show you why Jaguar EliteCare stands head and shoulders above the competition. Every 2016 Jaguar vehicle is going to feature a 5-year/60,000 mile coverage that features a bumper-to-bumper warranty, complimentary scheduled maintenance, roadside assistance and Jaguar InControl Protect and Remote. Jaguar Little Rock is proud to be able to offer you complimentary maintenance in an effort to keep your Jaguar running better, longer. Your Jaguar is always in great hands. If you somehow end up stranded on the side of the road in your new Jaguar, EliteCar also offers complimentary 24/7 Roadside Assistance. This applies to anywhere within the United States. If you aren’t familiar with Jaguar InControl, it is a great way to help you stay connected to your Jaguar. With a number of features that range from InControl Protect and InControl Remote, you have the ability to remotely start your engine or receive roadside assistance with just the push of a button. Compare Jaguar EliteCare with any of our competitors’ warranty plans and you will find that no one else’s even comes close. Not only that, but you won’t find another plan that offers as much as Jaguar EliteCare does either. If you find yourself interested in a 2016 Jaguar, look no further than Jaguar Little Rock. Stop by today and find out what the most incredible driving experience available today looks and feels like. We look forward to the opportunity to serve you!